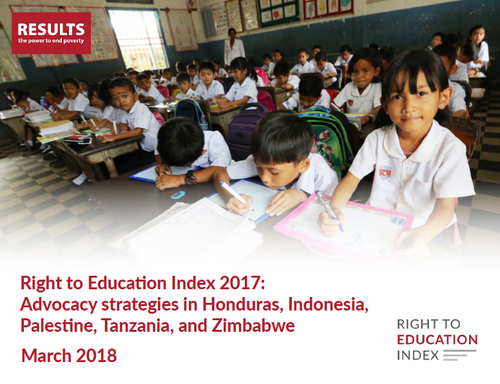 RESULTS Educational Fund is pleased to announce the launch of the Right to Education Index (RTEI) 2017 Report. The RTEI 2017: Advocacy strategies in Honduras, Indonesia, Palestine, Tanzania, and Zimbabwe report details the outcomes and impacts of RTEI 2017 advocacy strategies facilitated by RTEI partner organizations in Honduras, Indonesia, Palestine, Tanzania, and Zimbabwe. It first describes how RTEI is designed to support right to education advocacy, details national strategies, and highlights policy implications of RTEI advocacy. RTEI 2017 advocacy strategies provide examples of best practices and lessons learned in right to education advocacy, emphasizing the utility of the RTEI partnership model and research-to-action program design. The RTEI 2017 Report highlights five members of the growing RTEI Community of Practice. RTEI 2017 advocacy strategies were coordinated by Foro Dakar in Honduras, Network for Education Watch (NEW) Indonesia, Teacher Creativity Center (TCC) in Palestine, HakiElimu in Tanzania, and Education Coalition of Zimbabwe (ECOZI). Each strategy was based on findings from RTEI 2016 and civil society organizations’ (CSOs’) identification of pressing national issues from RTEI data collection. The results of these strategies indicate significant movement towards full satisfaction of the right to education in the five cases. Each national strategy encompassed relevant issues, highlighted marginalization and inequality in educational access and quality, and worked with stakeholders nationally and internationally to further advocate for the satisfaction of the right to education. Key takeaways from RTEI 2017 advocacy strategies offer lessons learned to other civil society organizations and highlight the efficacy of international partnership to support right to education advocacy worldwide.